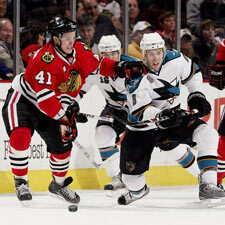 CHICAGO (AP) -The San Jose Sharks have looked quite comfortable away from home. 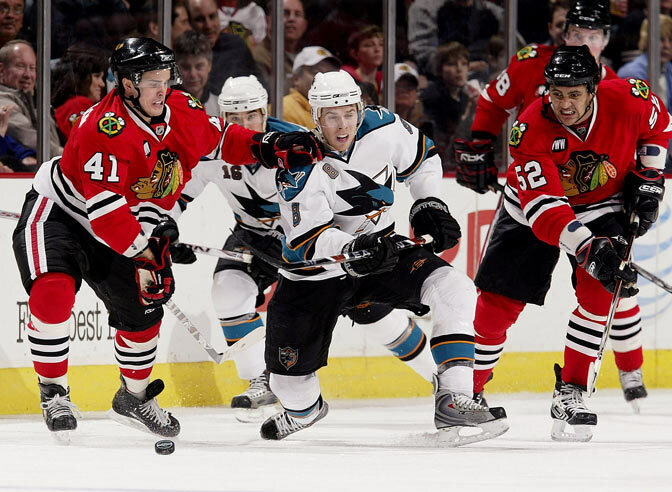 Jonathan Cheechoo, Kyle McLaren and Patrick Marleau scored as the Sharks beat the Chicago Blackhawks 3-2 and tied a team record with their eighth straight victory. "I thought we played almost a perfect road game," said Sharks goalie Evgeni Nabokov, who finished with 17 saves. "We've been skating well defensively," Nabokov added. "There was one weird goal, but we stuck with the system." The Sharks' win came on a night when the Blackhawks saluted Hall of Famers Bobby Hull and Stan Mikita, probably the biggest players in the team's history, in a ceremony before the game. That, combined with a season-high crowd of 21,908, gave Chicago some early energy. But the Sharks redirected the vibe in their direction. "That was great," said Marleau, whose third-period goal stood up as the winner. "Obviously, we knew we wanted to try to harness a little bit of that ourselves. They came out firing and were pumped up." San Jose coach Ron Wilson said his team continued to execute. "We were focused," Wilson he said. "You saw the way Joe Thornton was out there. He was a beast out there and controlled the game. "That's part of our game plan: to have possession of the puck and work it down low." For the third straight season, the Sharks are finishing strong. After going 8-1-0 in their final nine games in 2005-06, they were 13-1-3 in their final 17 last year. "We're still not where we want to be," Marleau said. "It's coming for us. We just have to keep working at it because it's still pretty tight and we want to get has high as we can." Patrick Lalime, normally Chicago's backup, made 20 saves in his seventh start in eight games. Chicago's No. 1 goalie, Nikolai Khabibulin, missed his eight straight game with back spasms. "The puck was on the walls a lot," Chicago coach Denis Savard said. "We didn't connect on enough tape-to-tape passes. Their forecheck was always in good position. Thornton is a great player, as good as they come. He sure makes things look easy." Still, Chicago got the early jump following the pregame tribute. Cheechoo tied it at 1 17 seconds later. From the front of the net, he chopped in Thornton's centering pass from behind the net. Marleau's goal with 5:29 left in the second, his fourth in three games, gave San Jose a 3-2 lead. After gaining a step on Seabrook, he snapped a shot from the left circle that beat Lalime under the blocker. Notes: The crowd of 21,908 was Chicago's largest this season and sixth sellout, the most the team has had since 2001-02. ... Hull is the Blackhawks' career goals leader with 604, while Mikita holds team records for career points (1,467), assists (926) and games played (1,394). Both starred with the Blackhawks in the 1960s and into the 1970s, and played for Chicago's last Stanley Cup winning team, in 1961. ... Sharks GM Doug Wilson, who played 14 seasons with the Blackhawks - and holds team career records for goals and assists by a defenseman - was part of the pregame ceremony and loudly cheered.